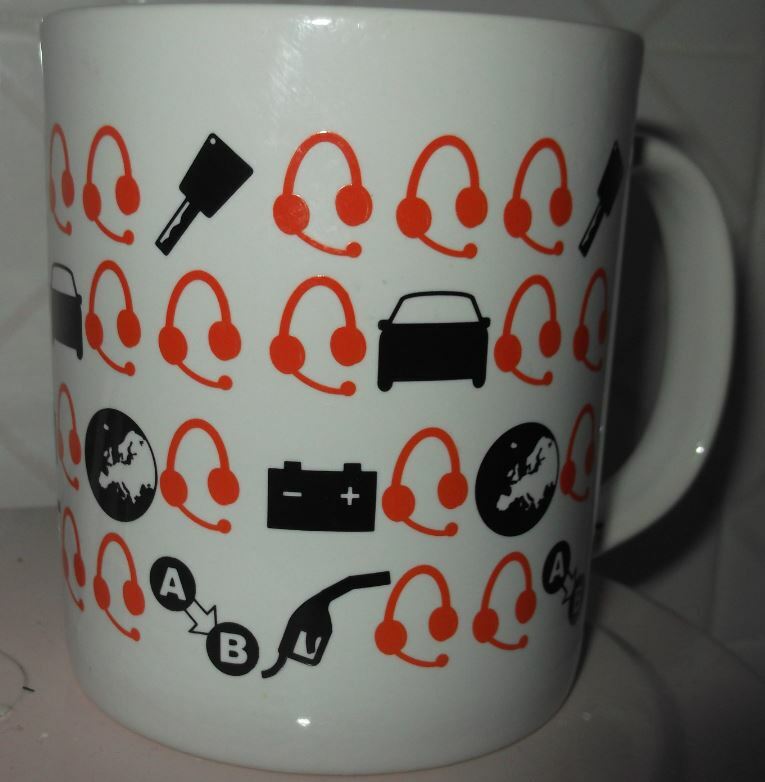 It’s common knowledge that most of the mugs featured on this blog are Charity Shop salvage or gifted / spotted by our followers but recently the magic of the Internet happened. 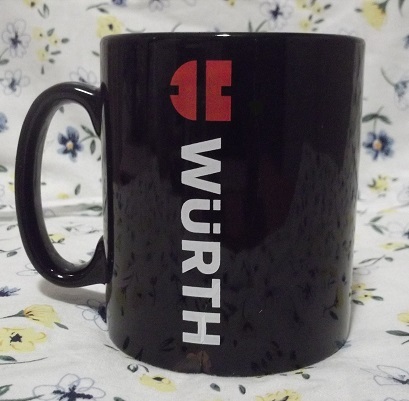 Following a visit to our humble blog we were contacted by one of the very kind people at Würth in Glasgow who said they’d love to send us one of their mugs to feature on our site. The mug was dispatched forthwith & despite the packaging stating ‘fragile’, it was pulverised by the Royal Mail. As it arrived at Mugspotters HQ the postie sheepishly handed over the package to a soundtrack of clinking porcelain and then slunk off into the late Manchester afternoon sunset. We knew this was not a good omen. What followed was much wailing and gnashing of teeth as the precious fragments were emptied onto the desk. A nerve-wracking yet primitive time-teamesque reconstruction involving Kragle (see The Lego Movie) ensued and the ‘North face’ of the mug was just about salvageable but the back sadly could not be saved. Once glued fingertips were rent asunder I took to email and thanked our contact at Würth. 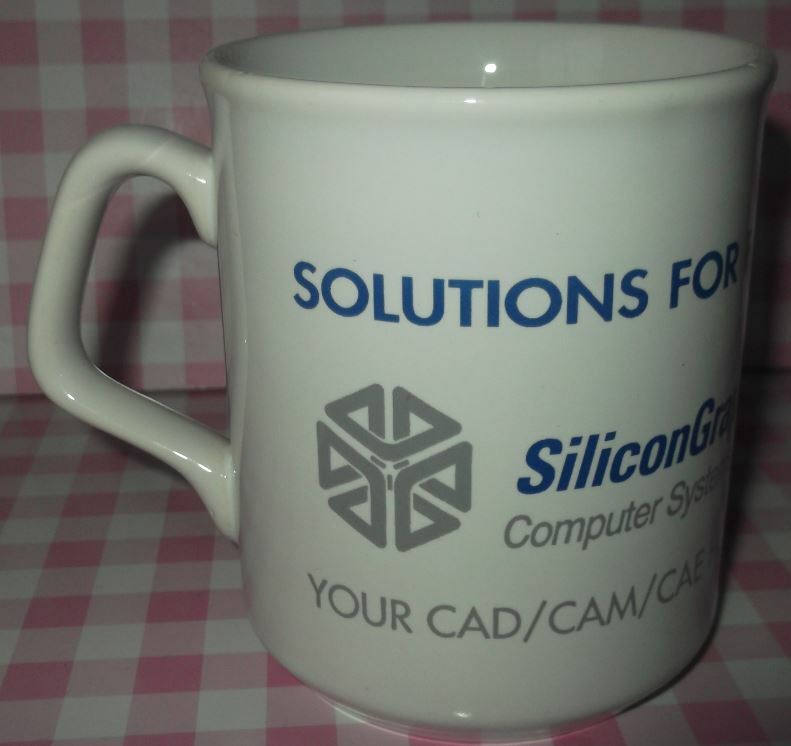 A second mug was promised but we can only assume the Royal Mail this time took a shine to it and it’s never made it to our door. A Director-level decision by the Mugspotters board unanimously decided we should go to e-press and publish this entry. Please forgive the hairline cracks and retouching work. We did the best we could. In reality it’s a lustrously svelte & glossy black Cambridge with Germanic styling and an intriguing motif. Our contact pointed out the ‘W’ in the logo comprises of 2 screw head / tips that they sell. 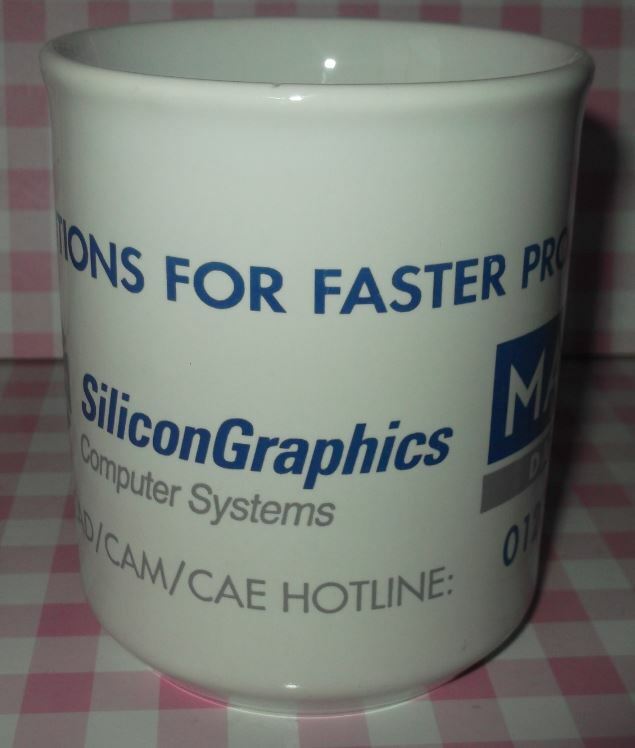 The rear aspect of the mug showed all the critical contact details but these sadly could not be photographed. According to their website The Würth Group is world market leader in its core business, the trade in assembly and fastening materials. It currently consists of more than 400 companies in over 80 countries with more than 66,000 employees on its payroll. Approximately 30,000 of these are permanently employed sales representatives. In the business year 2014, the Würth Group generated total sales in excess of EUR 10 billion. It’s vast but stylishly designed site and anyone with a passing interest in DIY and vehicular maintenance is bound to find it fascinating and you could maybe even become a customer. 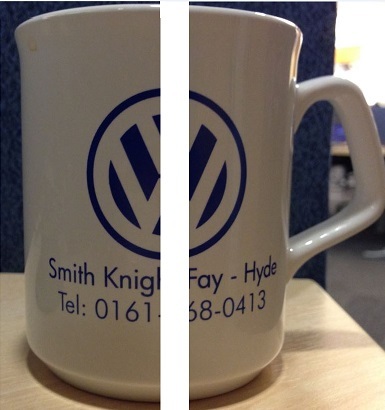 Not many mugs we’ve come across have had such a tortuous journey to make it onto this site and this one even paid the ultimate sacrifice & lost its life in the process but I’m sure you’ll all agree the effort has been Würth it. This Cool & deadly lustrous black Cambridge is licensed to thrill courtesy of Enterprise. They are veterans of Mugspotters who’ve graced our blog before with their cheap & cheerful Bell, but now they’re back & this time it’s serious. As far as Bond analogies go, if the Bell was Timothy Dalton, this Cambridge is Daniel Craig. I literally couldn’t sum it up better! Marques featured include everyday cloggers such as Audi, BMW, Jaguar & Porsche through to high-end Maserati’s & Ferrari’s. I’m not much of a petrol head, other than I’ll admit to liking Top Gear and Wheeler Dealers,** but I do like mugs and this is one 4.2 litre supercharged, V8 charged beauty. It’s for those who know, y’ know. 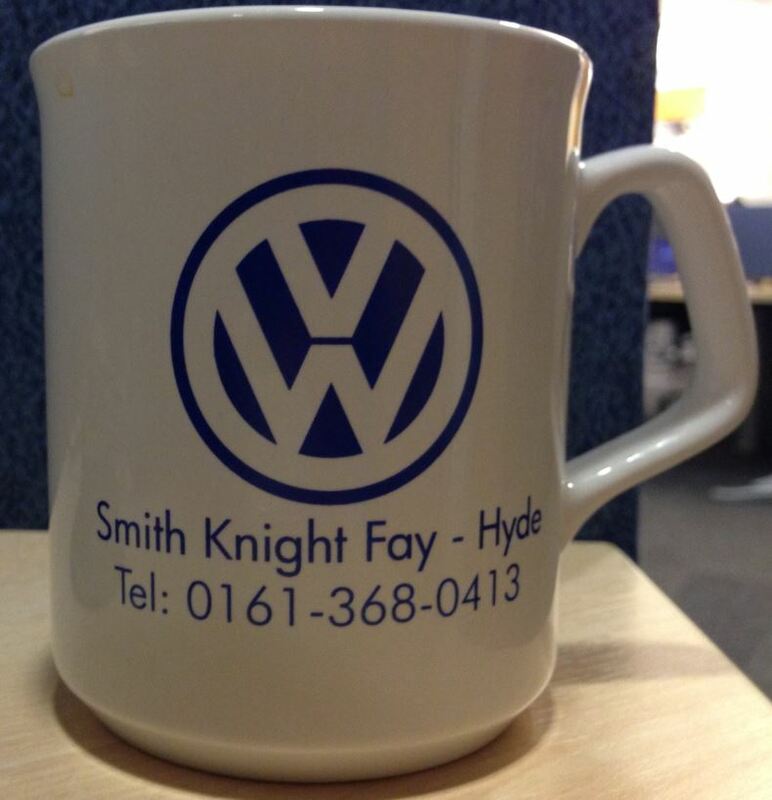 Spotted camper-ing out on a work station, we couldn’t “Passat” “Up” this opportunity to bring you this sensational Sparta for Volkswagen (translated as ‘The Peoples Car’), courtesy of Smith Knight Fay, Hyde Greater Manchester. You’d be hard pressed to find a more iconic and instantly recognisable logo anywhere on Planet Earth. Founded in Germany, 1937 it began trading as a luxury car brand but once Hitler annexed the company (the same he did with a few countries) he ordered the churning out of cars for the people and the rest is, as they say, history. Despite it’s murky origins, VW continues to be a world-famous brand and the Golf, Passat & Beetle are amongst the 10 most popular cars on the road today. I’m no VW aficionado but one of their most iconic vehicles is the VW Camper and especially the ‘Holy Grail’ Split-screen model. If you have never been in a Split-screen camper, for effect, here is the mug as seen from the front seat of that very vehicle. 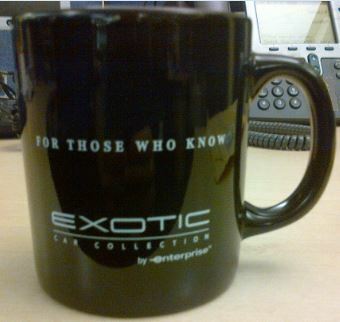 Hello John gotta new Mug? The Royal Automobile Club make their second appearance on our site with this charming Cambridge. 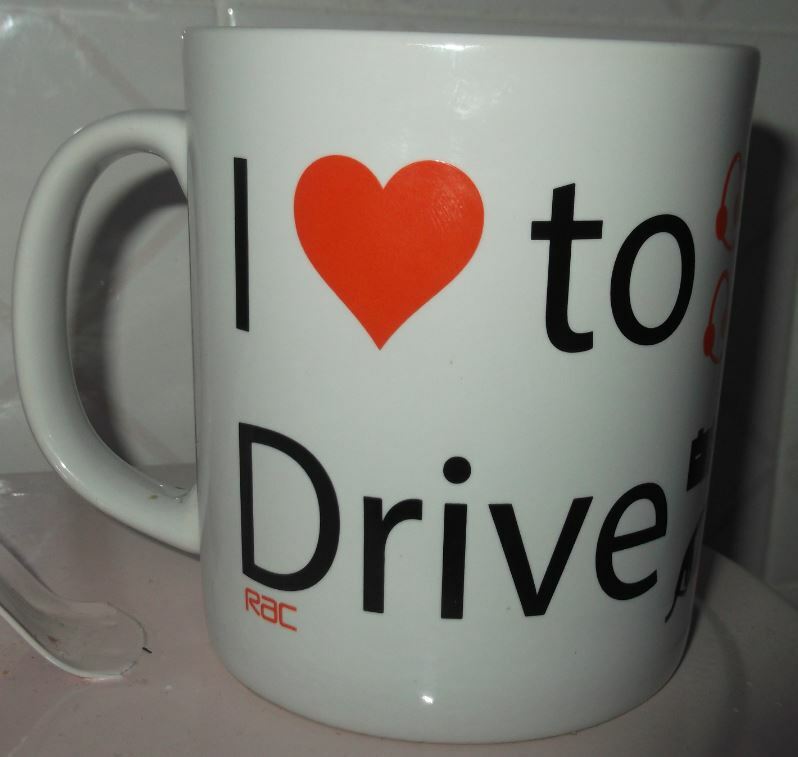 Apparently they seem to “Love to Drive”. I do not, therefore I’m open to offers for this trinket. Will suit first time Mugspotter. One previous owner; Nice two-colour artwork to rear. Ideal for Tea; Coffee; Hot Chocolate, Herbal tea; Hot Malt; Bovril, Hot Cordial. Good sized handle; Slightly stained interior. Dishwashable. Microwaveable. Low Insurance. Zero Tax. No time wasters. First to see will surely drink from it. “Yesterday is gone. Tomorrow has not yet come. We have only today. Let us begin.” Taylor Swift err sorry Mother Theresa. Mugspotters is not usually seen as a platform on which our team expresses our deep views on life but the above quote seems timely due to the fact the very kind & generous folk at Lancaster Training Services liked our Mirror Signal Mugnoeuvre post so much they got in touch via the site and sent us these superb images of their newly realised Cambridge. Fans of the original will denote that the cool vehicular graphics and logo are retained however there is now a very urgent message adorning its South face: THE CLOCK IS TICKING! Driver CPC. Get Qualified. Stay Qualified. 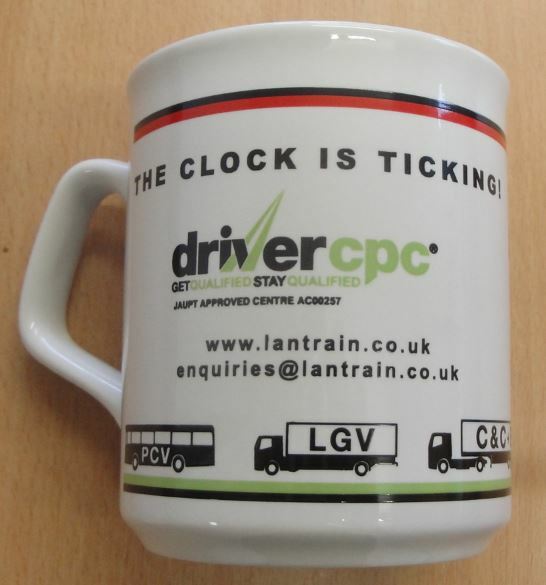 So, all industrial vehicle driving Mugspotters, what’re you waiting for? 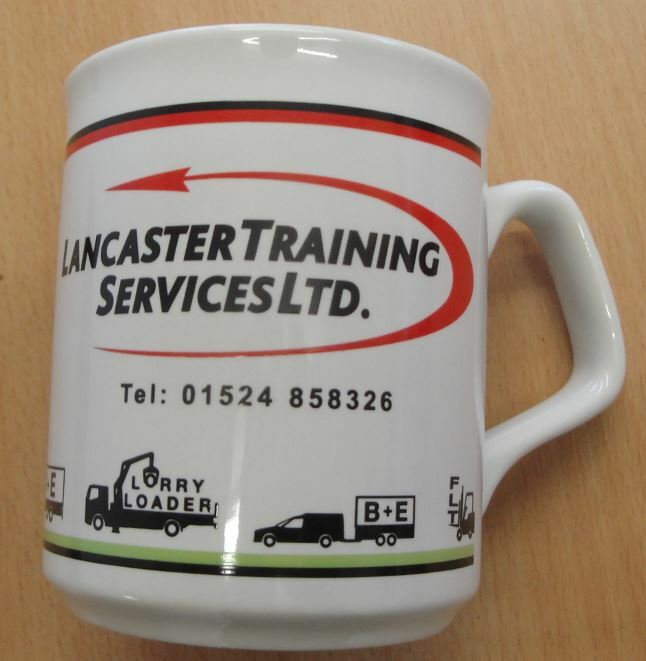 If you need Driver CPC – contact Lancaster Training Services at www.lantrain.co.uk. Oh Yes. Everything you’ve heard is true. It’s been the the worst kept secret on social media in recent weeks but we’re back after an almost 4 month hiatus, ready to bring you again the very best in tasteful trade earthenware. This Cambridge courtesy of Copart is a pretty understated affair. The white-on-dark blue printjob is a trade favourite and seen elsewhere on the blog in the guise of Veecam amongst others. We’ve been starved of product in these tough economic times so I’m just grateful we’re back on the scoresheet as it were. 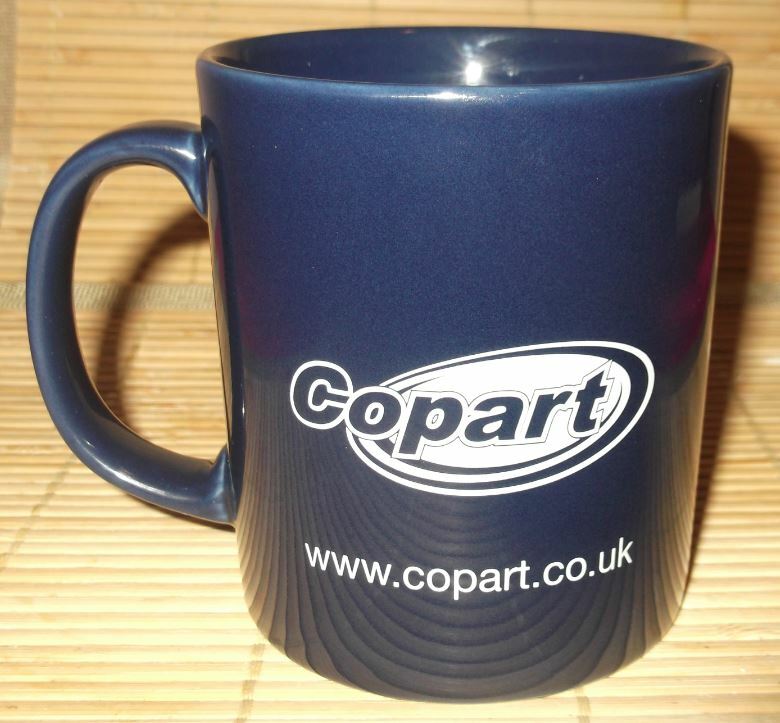 Copart themselves “sell thousands of vehicles via online auctions. Search for cars, bikes, vans, HGV’s, agriculture & plant – used and salvaged autos…” Basically an on-line scrap yard. 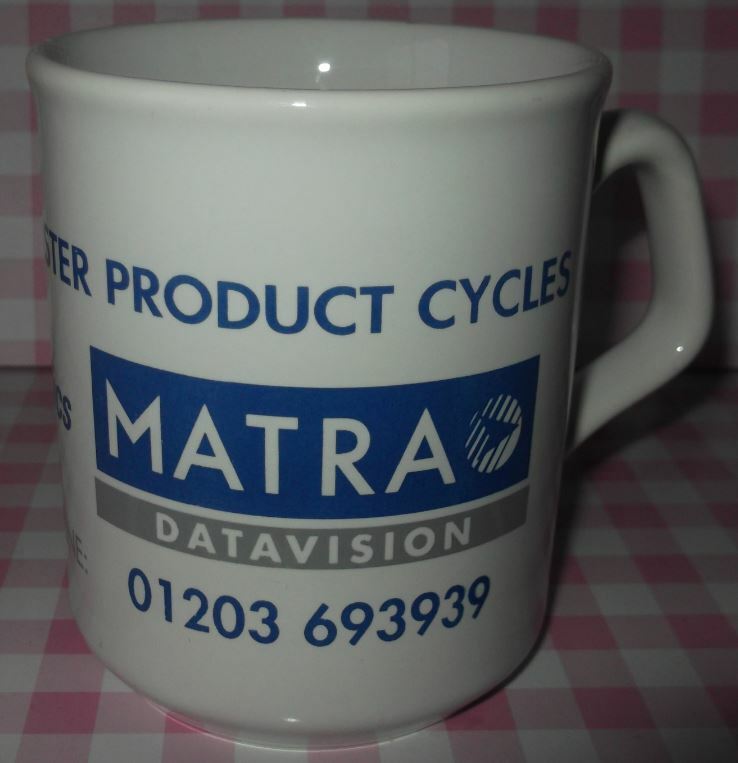 Pandora’s Box now comes with a handle in the shape of this rammed Sparta, courtesy of Matra Datavison. There’s no web address on this vessel, which means it must be old but considering one of its boasts is CAD (Computer Aided Design) we thought this rather odd, so Spotters took to the Information SuperHighway to find out more. Before we knew it we were embroiled in the world of French automobiles, aeronautics and weaponry.. In 1994, it became a subsidiary of the Largardiere Group and now operates under that name. If you too have no life, feel free to peruse the links. It’s a truly baffling netherworld of acronyms and jargon that must mean something to someone on this planet. On one page of their site it asks if you want the content translating into Ukranian, which quite frankly would have made about as much sense to me as the English version anyway!